Sometimes we all need a little inspiration, a fresh perspective to get us out of our cooking ruts and thinking beyond the proverbial pasta boxes. And in the whirlwind of these past few months, my cooking was in desperate need of a make-over. 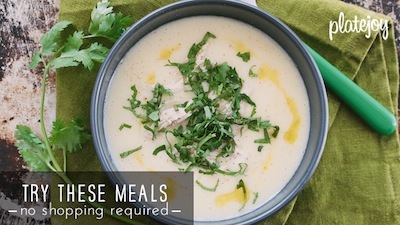 When not dreaming up something for this blog, my feeding schedule has become heavily dependent on three reoccurring meals: frittatas, tomato-based soups, and pork Ragùs. I know, kind of random. But across the board, I find that these recipes are all easy to make, comforting to eat, and successful at using up leftovers in the fridge. After a while, though, I started to realize that I constantly smelled like garlic and that my creative juices were running low. So like I said earlier, it was high time for some inspiration. My muse came in the form of an email – a simple invitation to interview one of Food Network’s newest stars, Claire Robinson, on her approach to cooking, her favorite foods, and her new partnership with Oroweat Sandwich Thins. Although Claire does not have any dietary restrictions, she is practiced at the art of cooking within limitations. 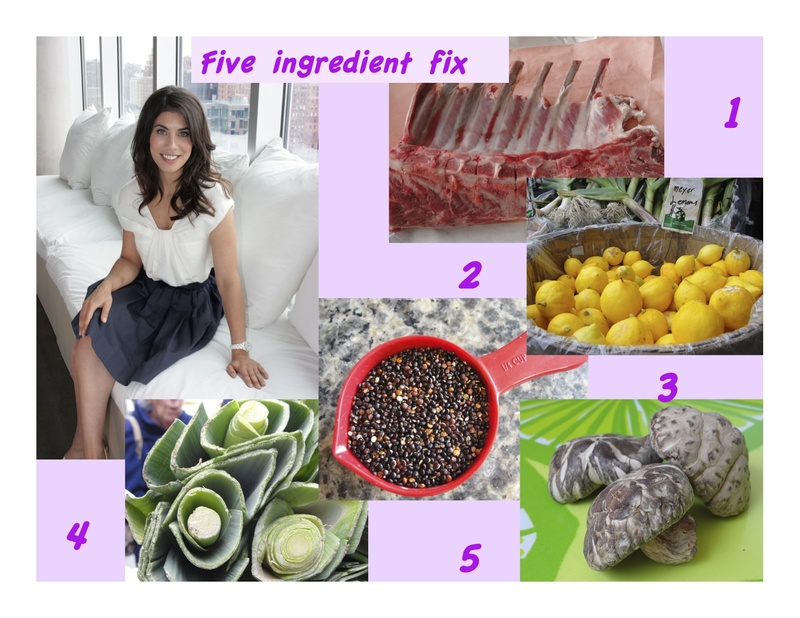 On her show, Five Ingredient Fix, Claire only uses five items per recipe (salt and pepper not included). This forces her to think carefully about each ingredient – its texture, its flavor, and its reaction with the rest of the dish. And although she loves to utilize hickory smoked bacon and browned butter, she’s not about taking shortcuts. Claire’s no wimp when it comes to a challenge. Even though Food Network told her she didn’t need to count oil or butter either, she decided to keep these as a part of the total tally, so that she would be forced to choose her fats wisely, keeping her foods tasty but healthy. 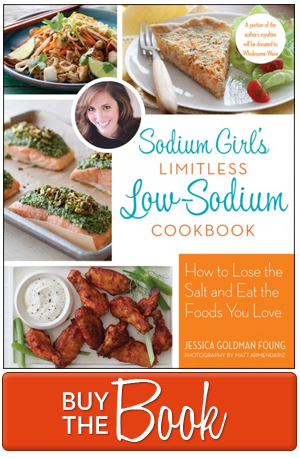 So how does all of this bacon-talk and Sandwich thinning relate to low sodium cooking? Well, first and foremost, talking with Claire reminded me that good seasonal ingredients – at their peak – give your food a lot of flavor without involving much else. Secondly, she made me realize that, to make up for salt, I tend to pack in a lot of spices, herbs, and other pieces of flare. But sometimes, focusing on just one or two taste points will actually make a bigger palate impact. And lastly, the simplicity of Claire’s process has refreshed the way I approach my food. Instead of pairing down recipes to five items, she builds up from one exciting ingredient. Her food is about celebrating something’s natural flavor and then using the few other components to enhance the experience. Even though Claire does not focus on low sodium cooking, I thought it wouldn’t hurt to ask her what she would do if she had to make the dietary shift. Like chefs before her, she wanted to remind readers that it is true that salt brings out and balances flavors – but there are many other things that do that as well. If she had to nix salt from her five ingredient fix, she would use the following: acids, like white balsamic vinegar; fresh herbs, like a pop of mint right before serving; the world of dried chilies; and most intriguingly, items like beets and white beans, that add a creamy texture to food. So next time you are standing in the store, wondering what to make for dinner, think of a simple phrase: What Would Claire Robinson Do? I’ll tell you the answer: Look for what is in season, pick up the first thing that shouts your name, and then add four more (low sodium) items to the list. Search for something with crunch, something with tang, something with spice, and something that soothes. With that, you’re on your way to cooking something that is bright, shiny, and new – and low sodium to boot. Count down and chow on. Check out my latest Examiner.com interview with Claire.